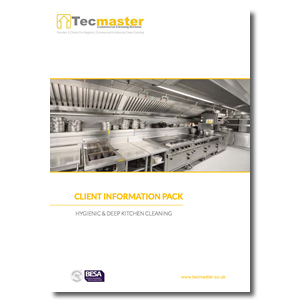 Tecmaster’s Commercial Deep Cleaning Service can be tailored to meet client’s individual needs ranging from a full ‘ceiling to floor’ deep clean to a specific piece of equipment. We aim to provide every client with a highly competitive quote whilst never compromising on our first class service. The removal of fatty deposits. The removal of burnt on Carbon. The build-up of any limescale. Having worked within the industry for over 20 years we realise flexibility is key. We appreciate cleans need to be performed outside of service hours and therefore Tecmaster’s operatives are available 7 days a week, 24 hours a day to accommodate any individual business needs.